Games Meet Metal: Riff's Rants: Duke Nukem Vs.... Axl Rose? 3D Realms were coming off the very strong success of Duke Nukem 3D back in 1997, so it was believed that the sequel would up the ante. DN3D had it's success thanks to clever level design reasonable challenging levels, and a bit of controversy as to how the game viewed women. All of this lead to a very nice cash cow for the company, and the sequel was expected to trump all expectations. In an effort to keep the artistic integrity all to themselves, the bigwigs of 3D Realms funded the project themselves, Mel Gibson Passion of the Christ style. That way, there wouldn't be any pressure from publishers as to when the game came out. As for Guns N' Roses, they were reeling from the success of Use Your Illusion 1 and 2. While neither sold as may as their debut Appetite for Destruction (18 million in the States! ), they did combine for nearly 16 million copies sold. During the time of Grunge, that was still very impressive. Their next album, Chinese Democracy, was expected to deliver equal, if not better, sales than the Illusion albums. So, Geffen gave Axl a shitton of money to get back into the studio and make history. 2. Say, this is taking a while. With only a trailer here and a screenshot there to show for their efforts, Duke just wasn't coming along all that well. That's one of the problems when you're self funded: there's really no one around you to tell you that you've got it done. Oh no. these guys kept continuing with barely a voice of reason guiding them. They wanted perfection, and they wanted it on heir terms, baby! 3D Realms also ran into a major problem, when the Quake II engine they were using to develop Duke was blasted by Epic's Unreal Engine and the release of the first Half-Life. Both of these projects made 3d Realm's previous efforts look pedestrian. Thus more timed was poured into production to directly compete with these new opponents. As for G n' R, the issues there were growing into a powder keg. Axl Rose was becoming more and more of a dictator. Plus, the rest of the band was so wasted on drugs, that barely any work ever got done on Democracy for the first year. Eventually, Slash, Duff, Izzy, and Matt Sorum all left the band in disgust. Not that it mattered to Mr. Perfection himself Axl, as he'll just hire some new musicians to take their place. And he did hire them. Several times over. Seriously, pull up Chinese Democracy on Wikipedia and see how many band members Axl blew through. It didn't matter to Mr. Rose though. Just like 3D Realms, he wanted it just right. Only, in his case, he was using Geffen Record's money, not his. Remember that whole self funding thing the big wigs of 3D Realms thought would help them? the money that had been built up by Duke Nukem 3D? Well, big surprise, the money was drying up, and it was drying super quick. In an effort to finish the game, they went to their publisher Take-Two for a few extra bucks. Like, say, $6 million. Take-Two said yes, but it was half now, half when the game was finally done. That didn't sit well with 3DR, and they suspended the DNF staff once funds had completely dried up. Take-Two replied with a lawsuit, claiming that 3D Realms never delivered the product they promised they would. The case was settled out of court, but the damage it had done to 3D Realms was beyond repair. As for Axl, Geffen Records was getting right mad at Axl for spending $13 million of the label's cash on album that has taken a decade and a half to finish. So much so, that the label was able to put a lean on Axl's house to make him deliver a final product. If that wasn't bad enough, a mix of unfinished and fully mixed tracks were popping up on the internet and radio. And everytime it did, Axl or Geffen sent the heat in to take down the operation.One poor digital distributor had his house raided by the FBI after he posted a couple tracks on a torrent site. So, yeah, Axl's reputation was just awesome at this point. Duke's revival was very well documented at Pax Prime this year, thanks to Gearbox buying all of Duke's intellectual property and attempting to give Forever a reasonable chance at the stores. Chinese Democracy's full reveal was also a surprise, as what was it's promotional campaign. All copies of Chinese Democracy would be sold exclusively at Best Buy..... in a few weeks. A few weeks? That's barely enough time to do any PR for a cd. Let alone that Axl isn't too keen on radio interviews or touring behind the album anytime soon. You can probably see where this is heading. 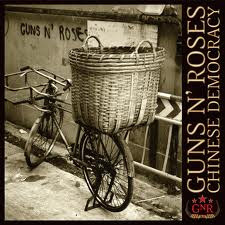 Guns N' Roses Chinese Democracy, was finally released on November 28, 2008, and it completely bombed. It debuted at #3, and quickly dropped off the chats after that. Without any major advertising push, it was no wonder why the album didn't sell barely anything. Since Duke hasn't had it's release just yet, it's a little premature to say if it'll be a total flop. With some creative PR, Duke can have some success. Even then, it's gonna take time to shake loose the stigma of the vaporware status. In the end, I hope for success with the Duke. Movies like The Expendables and The A-Team has shown that there is a market to cater to that over-the-top 80's super hero fan out there. Unfortunately, there doesn't seem to be any market for a stuck-up singer from the 80's. Just shame and regret. It could of been something.